"DOES IT HAVE TO BE SO UGLY?" This photo-illustration shows what a proposed rail transit structure would look like along University Avenue. The federal guidelines are meant to protect marine mammals. 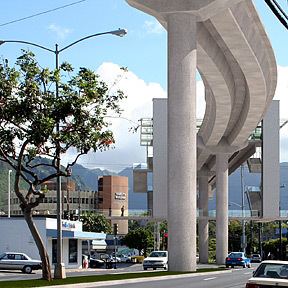 >> A councilmember cries "ugly" at plans for a 70-foot-high station at H-1 and UH. The O Lounge's Liz Watanabe will show her stuff at Taste of Honolulu. Stephanie Kono is joined in the next round by Mari Chun, Amanda Wilson and Kimberly Kim. Personal information was stolen from Bank of the Orient in L.A. Authorities believe a fire at the University Laboratory School was intentionally set. North Korea maintains it has a right to perform long-range missile tests, despite a missile moratorium.